This Instant Pot hamburger soup is easy and flavorful! It’s a healthier comfort food that uses simple everyday ingredients. The whole family is sure to love it! This soup is great because you can throw in extra veggies if you have them on-hand, and you don’t have to worry too much about measuring anything out, in my opinion. I love forgiving recipes like this. In my “real life” I rarely measure anything. I think there’s a certain freedom in cooking when you ditch the measurements. Just don’t try it with baking. And that is why I rarely bake. I love how the Instant Pot makes everything fall-apart tender after only a short period of cooking. And you don’t have to mess up the stove. But you do have to clean your Instant Pot… sorry. This electric pressure cooker hamburger soup is delicious without being creamy. Like I put in the write-up of the stovetop version of this recipe, creamy soups are typically my favorite kinds of soups, but this one is a new favorite for me even sans cream. 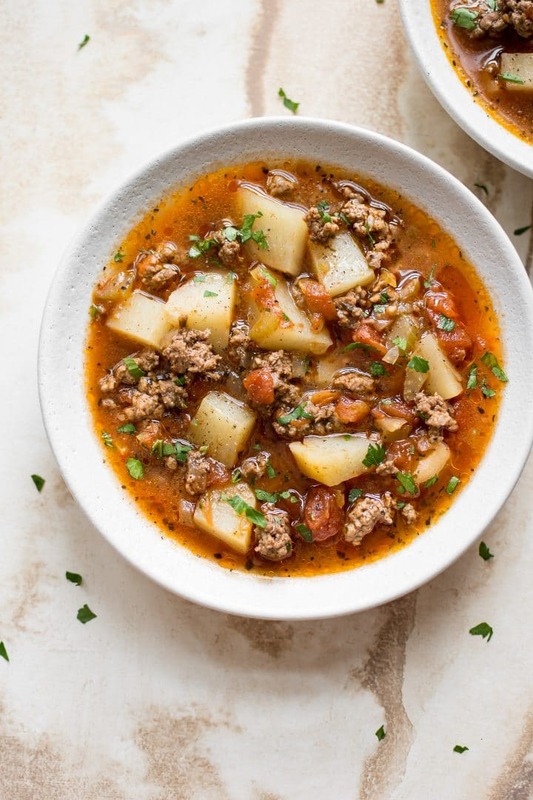 The tomato broth is flavorful, and the beef and potatoes make it nice and hearty. Pro tip: I like to use extra lean ground beef because it’s a bit less fatty, so you can skip the step of draining the fat once you’ve browned it. There’s still a bit of fat left, but I find it adds a nice flavor to the soup. If you do use a fattier ground beef, I would definitely drain some of the fat so the soup doesn’t end up excessively oily. Like ground beef in soups? You may also like my Instant Pot stuffed pepper soup. Let me know in the comments below if you’ll give this easy Instant Pot hamburger soup recipe a go. 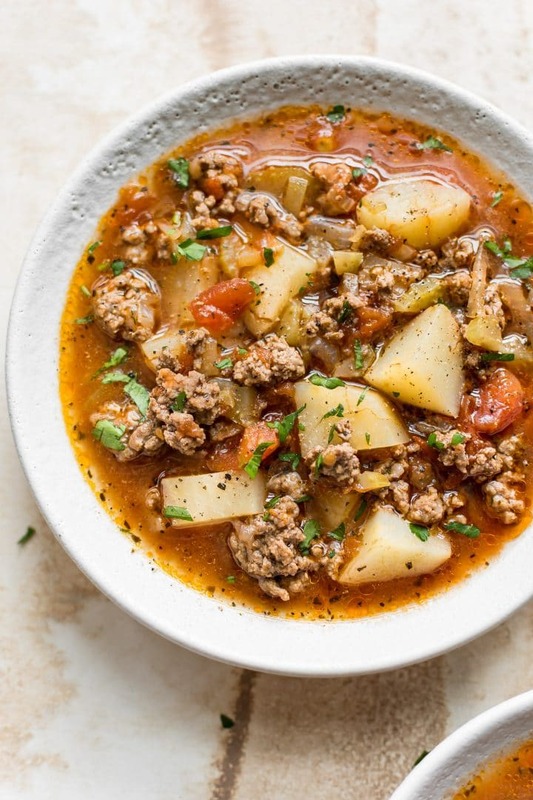 This Instant Pot hamburger soup is easy and flavorful! It's a healthier comfort food that uses simple everyday ingredients. Add the olive oil, onion, and celery to your Instant Pot. Press the sauté button and cook for 4 minutes. Stir beef and garlic. Cook until the beef has browned, stirring occasionally (about 5 minutes). You shouldn't need to drain much fat if you're using extra lean ground beef, but feel free to drain some/most of it if desired (I didn't drain any). Stir in the tomato paste, then add in the diced tomatoes, beef broth, potatoes, and Italian seasoning. Close the lid, make sure the valve is on "sealing", and cook on high pressure for 8 minutes. Once the countdown has finished, carefully do a quick pressure release. Season with salt & pepper as needed and serve immediately. Anything from about 1 to 1.5 pounds ground beef will work. Use low-sodium beef broth if you're sensitive to salt. Try the stovetop version if you don't own an IP. I tried this recipe today. I had never made soup like this and used real beef patties. Didn’t have italian seasoning at home so used: Oregano, Basil, Thyme and Rosemary which makes the same combo. It came out really good. My son says the food smells really good. I will put this in my “copy me that” recipes. I’m glad you liked it, Annemarie! Made this yesterday for supper, turned out great! I’m so glad to hear it, Marg! I made this today. I wanted no potatoes so put chunks of cauliflower. I also added some sliced mushrooms, green beans and some corn. Great flavor!